Two Roy Moore campaign staffers "manhandled" two photojournalists from Fox News in Alabama on Monday night, the network said. Videos of the altercation backed up the network's account of what happened. The camera crews were trying to get a shot of Moore arriving at a rally in Henagar, Alabama -- his first public campaign event in 11 days. The Moore staffers "decided to push the cameras back and physically manhandle two Fox News photographers, pushing them away and grabbing their cameras," Fox News correspondent Jonathan Serrie said on the air Monday night. A Fox producer intervened. The photojournalists were not injured. Several women have accused Moore of having pursued relationships with them when he was in his 30s and they were teenagers. One of the women was 14 years old at the time that, she alleges, he sexually assaulted her. Moore has denied the allegations and avoided the news media during the final stretch of his campaign for a vacant U.S. Senate seat. He has also refused to debate his opponent, Democratic candidate Doug Jones. Because Moore has held so few public events, journalists flocked to the event in Henagar with the hopes of hearing his remarks and asking him questions. 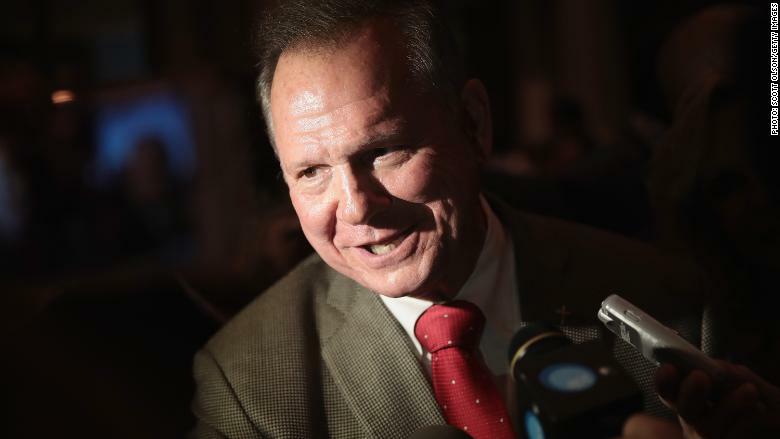 When it became clear that Moore was arriving through a side entrance, not the front door, camera crews scrambled to catch up to him -- and that's when the situation got tense. One of the reporters who shared video of the scuffle, Connor Sheets, said one of the campaign staffers "physically attacked a cameraman." Fox called it an "altercation" and noted that the photojournalists were standing on public property at a city-owned community center. Serrie said on the air, "It's not unusual for people to get bumped around a bit in the media scrum. This was not a scrum though. It is highly unusual for members of a political campaign to physically engage in this manner with members of the press." Moore campaign chairman Bill Armistead told the network that the campaign "certainly doesn't condone any pushing or shoving of anyone, certainly not reporters or anyone else." The Moore campaign did not immediately respond to a request for comment from CNN. Inside the event, Moore compared the allegations against him to the ongoing probes into Russian interference in the 2016 presidential election. Afterward, "he took no questions from the media and no questions from the audience," Serrie pointed out.